Unstable subsurface and rocky banks and the resulting buildup of hydrostatic forces prevented engineers from employing directional drilling. Since this occurred during the pipeline project’s final phase, time was of the essence to prevent the boring’s potential collapse. D&G was at a standstill and at risk of not being able to complete this pipeline project. To reduce the need for bypass pumping, Rain for Rent engineered and designed a gravity-fed bypass piping system. Then Portadam provided a combination of a 5-foot, 7-foot, and 10-foot-high system with additional bracing, flume bypass, and scour protection. A three-sided cofferdam with pumping was installed in the project’s final phase. 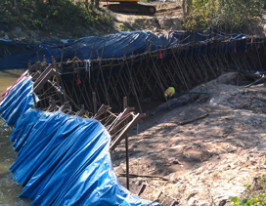 D&G Boring saved $500,000 in bypass pumping with Portadam’s custom designed cofferdam system, while Rain for Rent’s engineered design solved D&G’s Boring collapse problem.